Subject: You're 'aving a larf. Paperclip Railways – Express Edition is designed by Tony Boydell and is published by Surprised Stare Games. It will accommodate 2 to 5 players and will take between 45 to 75 minutes to play. Occasionally you ask yourself the question, just how much fun could this be? If you're playing Agricola that question doesn't come up at all, but for the rest most games throw that question out there. 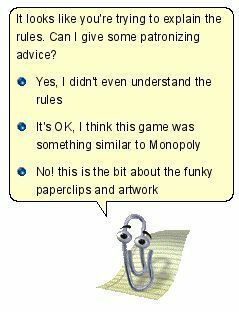 I mean Paperclip Railways is a railway game with office supplies. So I repeat, just how much fun could this be? It turns out it's fun as hell, but not for the reason you probably think it is. Most of us are coming at this game with a prior knowledge of String Railway and basing our high expectations on just how much fun and quirky that is. We want more. We want that tactical fast moving game-play. 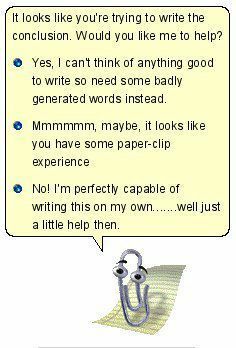 So you may think that Paperclip offers that, and in short it does. First up though let's take a look at the artwork and rulebook. The cover image is a nice one that uses washed out colouring and paper-clips to make the image of a modern train. This image is used on rulebook cover, on the score board, and on the back of the station cards. Either by accident or design the rulebook and components have that cheap office look about them. The use of Comic Sans font indicates to me that the design is on purpose. At least I do hope so, as Comic Sans is only permitted to be used ironically. The rulebook itself is short and clear, and gives a good description of the central component the station cards. Beyond this and the game set-up illustration there are no diagrams at all, but, to be honest, diagrams aren't really needed for this one. The book is a little bit deceiving. It's 12 pages long in A5 size with a fairly large font. However 5 and 1/2 of those pages are the game set-up. Somehow that is really long and convoluted to explain. In reality it's fairly simply. The game in itself is straight-forward and shouldn't take more than 10 minutes to explain. 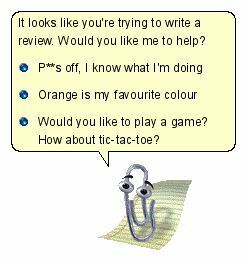 Players have a supply of paper-clips in the their own colour. There is a draw deck of station cards, and a central metropolis and some obstacles (including the ubiquitous river) to make the table-top board a little less mundane. The winning condition is victory points, which players gain by connecting stations and through some end-game scoring. There is no money to be earned, no loans to be taken, and no shares to sell. As stated earlier, this is tactical game, and most of all it's fun to play. On a turn a player can either draw two new station cards from the deck or build build a link. When you build a link you must build from an existing station, which you are already connected to, to either an other existing station or a new station played from your hand. This link will require paper-clips, so cards must be discarded to buy the clips you need. You get 3 clips per card you discard. Join the clips together and make the link. You lose points if your link touches or crosses obstacles or other players links. It's that simple. As with String Railway the tactical play comes from the placement and use of the stations. The stations are divided into 4 broad types, housing, tower block, factories, and park. Each station defines which other station types it can be linked to, and the minimum length of the link. Additionally each station can only be linked to a certain number of times. Players place a cube on the station when they add a link to help with the visualization of who has connected and how many times. It really helps as the paper-clip chains are not quite so distinguishable as strings. Also at certain points in the game additional blue cubes (not a player colour) will come into play. These are placed onto stations reducing the link capacity for that station. Brought into play at the right time these can really kick an opponent in the teeth. So at this point you can see there are some nice play possibilities for blocking and extending. It's a nice race as you rush to connect to a station or get yourself out of a tight corner. Laying new stations needs some careful thought as you could also create scoring opportunities for other players. There's a nice bit of hand management too, as you have to discard cards to build the link. If you've got a fist full of cards that will give you points-a-plenty some of them are going to have to go. The thing is though, that this is only a hint at the options and variety in this game. There are over 100 different types of station (and over 140 station cards into total). When I first opened the box and saw the reference card it was pretty over-whelming. As it happens it's not so intimidating. The city cards are reasonable large (well larger than the String Railway ones) and have full text on them to explain how the station works. Some some stations are very euro in style, such as +1 free paper-clip per link, increased hand-size, and end game scoring for number of particular station types linked to. Others are quite whimsical, such as City in Flight which requires the player to throw the card into the air and will either pay 1 less card to build links this turn or lose 3 points depending on which face it lands. I won't give any more away than that. It is great fun discovering some of the cards for the first time. It's then even more fun working out the best way to use them. As with any good euro game the real crux comes in working out those killer combinations. If you can get some bonuses and benefits in play it can give you an advantage. There is certainly a lot to explore. The variety in the game is further increased as during the game you actually only use 2/3rds of the station cards. So there is no guarantee that certain cards will turn up. At first I dismissed this game as nothing more than a String Railway clone. This was quite uncomfortable to contemplate, a British guy was copying Japanese invention. It just seemed wrong, my simple brain couldn't get around that concept. However, as with anything of worth it is there because it stands on shoulders of giants. Paperclip Railways has every right to stand where it does. It's take a novel mechanism and done something different and interesting with it beyond simply replacing string with paper-clips. I own String Railway, String Railway: Transport, and Paperclip Railways and each do their own thing, all deserve a place in any collection. As you play this game and admire the variety and invention in the station cards your brain gets buzzing with other ideas. It's one of the few times I'm disappointed the game doesn't come with some blank cards. It would actually be nice to create your own. Looking at the expansions available for this they are all mini and promo expansions. For me, that's where the exact type of expansions this game needs, a few extra cards and the odd rule to spice things up a bit. I'm hoping at Essen 2012 there will be some more expansions to buy. With so many games that are points driven as the game end closes in the play slows down as everyone tries to eke out every last point they can. There's some sort of inverse of time and space. The fewer options there are, which tends to be case later in the game as stations become full, the more time it takes people to decide. This dry ending can mean you leave the game with slightly less enthusiasm than you had for 90% of the game. Stick with it though and try to keep the pace up. Remember the good times though, because with this game there are plenty of good times to be had.